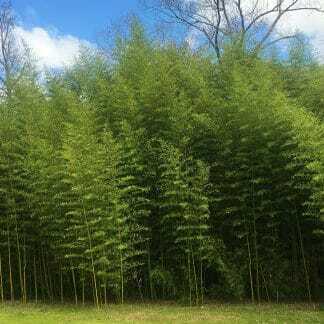 Bamboo is a very easy plant to care for, follow these tips and our planting guide and you will see the true beauty of what a bamboo grove can provide. This is the most important part. Watering will help establish your planting and produce better results. Over the next couple of weeks, daily watering is recommended. If your plant does begin to loose leaves, it may be just adjusting to its new home and sunlight conditions. Even under most all conditions, the bamboo will retain 70% of its leaves. After a period of time, it should put on new leaves to replace the ones it dropped during the transition. If any stress like defoliation is noticed increase watering times. Water is the key for health bamboo. During the hot summertime even established bamboo will roll their leaves to prevent transpiration. This is a neat characteristic of bamboo so, do not be alarmed to see your bamboo roll up its leaves. If you water it during very hot times that is great and will assist the bamboo during its growth. Once established, bamboo needs little care and normal rainfall is generally all that is needed. Watering daily if you have well drained soil is great! The only time you should not water, is when the bamboo is sitting in standing water. 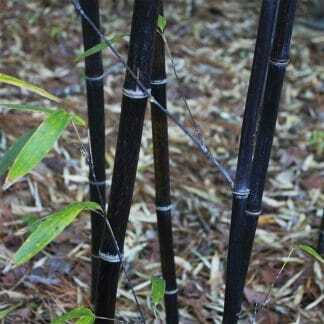 Remember the bamboo canes on your existing division are through growing. Most all the growth now will be underground . Each Spring new canes will emerge taller and larger in diameter each year until mature size for your species and climate zone are reached. The three numbers on fertilizers are important factors. The first number represents nitrogen. Nitrogen is the element for growth. The second number is phosphorus and it has to do with the transfer of carbohydrates. Carbs are essential for the bamboo to store nourishment in the rhizomes. The last number represents potassium and is necessary for photosynthesis. This is very important for the plant’s metabolism. Extra amounts of this element helps the bamboo to withstand drought, heat and cold. 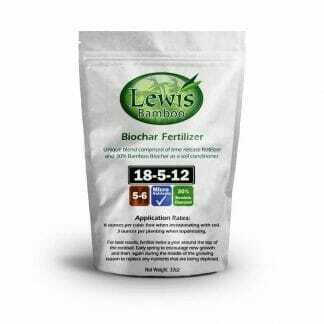 We offer a special time release fertilizer with the addition of bamboo biochar. The biochar acts like a sponge in the ground allowing the nutrients and water to be available at a more absorbable rate for the bamboo. We recommend adding 3 ounces of our fertilizer per plant, twice a year. Once during the spring to encourage new growth and then again during the growing season to replace any nutrients being depleted. Addition of organics can be very beneficial to your plantings too. This is accomplished by adding mulch (like bark, leaves, hay, grass clipping, etc.) and compost to your bamboo. This will help retain nutrients while amending your soil.